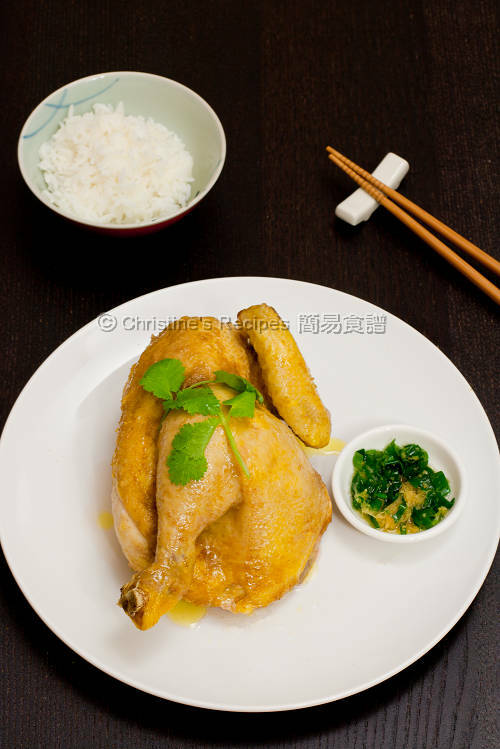 This steamed chicken with Sand Ginger powder dish is very simple and delicious. It's a traditional Chinese dish, best served with steamed rice and ginger and scallion dipping. Simple is the best. You can’t imagine how nice the taste of this steamed chicken was. The chicken meat is so tender and silky smooth, steamed to just cooked. If you like the traditional, popular Chinese steamed chicken (白切雞), you have to try this dish as well, if you haven’t. Try to use organic or free-range chicken if you can to ensure the best result. Having said that, I used corn-fed chicken this time. So, that’s why my steamed chicken was in bright, lovely yellow colour. The end result remained wonderfully good. Simply rub the chicken with a handful of sand ginger powder, you’ll see that would do a magical makeover of your chicken, giving you a pungent aroma. Don’t mix up sand ginger powder (沙薑粉) with ginger powder (黃薑粉). Sand ginger powder looks slightly pale, whereas ginger powder looks more yellowish. Although both of them are in the same ginger family, their smells and tastes are quite different. Many Asian grocers stock sand ginger powder. If you can't find any there, try some Chinese herbal shops. Rinse chicken and wipe dry with paper towels. Season with salt, pepper and wine on skin and inside. Leave it for a while, then rub sand ginger powder evenly on chicken on all sides. Place grated ginger and diced scallion in a small bowl. Season with salt. Use a small saucepan to heat oil over medium heat. When you see a bit of smoke arising, carefully pour over the ginger and scallion. Set aside and let cool. Use a large dish, place ginger slices and scallion, topped with chicken. Steam over high heat for about 20 minutes, or until cooked through. Test with a chopstick or needle and insert into the thickest part of chicken thigh. If clear liquid runs out, it’s cooked. Remove from heat, let rest for 10 minutes. Cut into smaller pieces. Serve warm with the ginger and scallion dipping. Sand ginger powder is available at Asian grocers. Don’t mix it up with ginger powder. oh this dish looks so good Christine! Do u have the picture of the sand ginger? 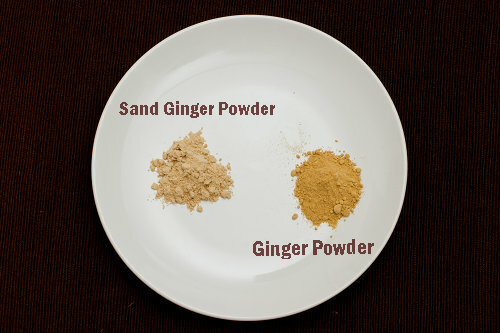 Uploaded a photo of sand ginger powder, comparing with the look of ginger powder. Hope it helps. Looks like an awesome dish. I have never seen or know about sand ginger powder. must check out KFL. Woo! That chicken looks so juicy and delicious! My whole family loves steamed chicken! I need to find some of this sand ginger powder! I've never known about sand ginger. Next time, I go for grocery shopping, I have to look for it. Having tried the technique of steaming chicken recently (and loving it) I welcome this suggestion and will try this spice next time with great anticipation. No doubt with your result : ). I like to have sand ginger made into a paste for dipping as well. Oh this is really yummy! So gingery fragrant ;) I bet the kitchen smells awesome after this dish! It looks indeed juicy and tender! I have not heard from sand ginger before! I am certain this is super delicious. I know what I'm making for dinner this weekend...this chicken is absolutely beautiful. Have you heard of the Real Women of Philadelphia? It's Paula Deen's cooking competition and I believe it's still open for entries. This gorgeous bird a la ginger is right up its alley. WOW! This is absolutely delicious. I have sand ginger plant in my backyard but really don't know how to use it. How do I make use of the ginger plant in this dish? 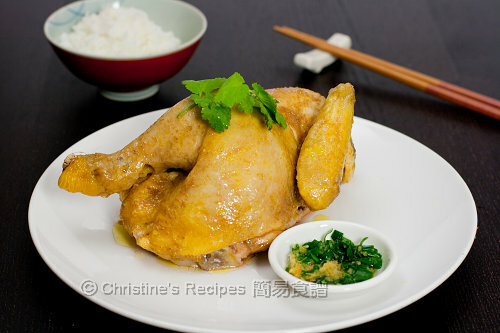 This chicken recipe sound simple the only thing is I have to look for sand ginger powder! I'm very intrigued by the sand ginger powder, must find it to try! I had to do a double take Christine when I first saw the picture - the top shot looks amazing - very appetizing. I've missed visiting your blog - but am glad that I didn't miss this post - Im going to show my Mom so she can make it for me! your chicken looks AMAZING... I have to look for a bottle of sand ginger powder in my area. woh, looks so good! Time to look out for that sand ginger powder! Haha I apparently have been using sand ginger powder my whole life without realizing it. Thanks for the enlightening post! Christine, I was back to thsc post as one of my readers in Malaysia told me that Sand Ginger is what I know as kencur or cekur in Malaysia. We use fresh kencur curries and sambals. It works with fresh root and leaves, but both of the flavour and smell of the steamed chicken are very different. hi christine, i was in hkg end of last month for a holiday and fell in love with the sand ginger. I had that at a dim sum rest where they served with chicken feet, i really love the aroma of it..i'll try to see if i can find these in herbal shops here. Haha, i'm quite the opposite - i always use sand ginger powder, and have never used the yellow ginger powder before..
my chicken turned out disastrous! i don't think my steam set up was very good, need a bigger pot. also the skin was very dry, am i supposed to rub oil on the skin before steaming it? on the other hand, the dipping sauce was perfect! First of all, don't over cook/steam the chicken. Secondly, don't open the lid once you turn off the heat. When it's done, let it stay in the wok for a little while, the chicken will absorb the steam, then becomes moist and soft. Is Sand ginger powder the same as Galangal powder? I better visit the chinese grocery store tomorrow. I will definitely make this dish as soon as I have the sand ginger powder!! Hi! Where can I find sand ginger powder in Hk? You might get it from supermarkets or 雜貨店 in wet markets. Hi Christine, do you buy a whole chicken and halve it yourself or did you buy one already halved, also could you steam a whole chicken? How would the cooking times vary? Thanks for sharing this recipe! I bought a whole chicken and cut it into halves to create this recipe. We couldn't finish a whole chicken, 1.5kg, for a meal as we had other dishes to go with this chicken dish as well. You need 5 mins more if steam a whole chicken of about this size. Remember to place the chicken breast upside as it'll be cooked through easily. When time's up, turn off the heat and leave the whole chicken in the wok inside with lid on for 5 minutes. Test the chicken thigh with a chop stick. If liquid runs out clear, it's cooked. Hi Christine, Sand ginger powder is Sar Keong and has a spicy taste? Can be used in Perut Ikan and other Nonya cooking? Yes, sand ginger powder is 沙薑 (Sar Keong). It's not spicy, only with a very nice aroma. I haven't experimented it with Nyonya cooking. It doesn't hurt, if you only add a little bit of it to test the taste. If you like it, then you can try more. Hi - do you have the recipe for chinese steamed chicken? No, sorry. You might refer to this recipe to make steamed chicken. Just skip the seasonings. I love these dishes with a good low-effort-to-good-taste ratio. Reminds me of when my grandma used to cook it :) Although my chicken wasn't as yellow, it was yummy nonetheless! Dishes with a good low-effort-to-good-taste ratio are very popular. Btw, I used corn-fed chicken. That's why my chicken looked more yellowish. If i use a whole chicken do i need to double everything in your recipe? Yes, double all the other ingredients if you use a whole chicken. But it's not necessary to double the cooking time. The cooking time varies depending on the size of your chicken. Can I steam this dish in the Instant Pot? If yes, what is the setting and steaming time? You can steam chicken in IP. Unfortunately, I haven't got any testing record. Sorry. The cooking time depends on the size of your chicken.